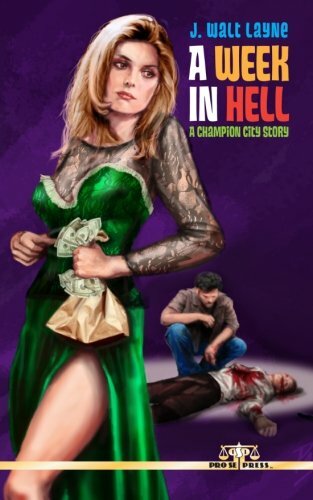 Pro Se Productions continues its tradition of providing the best in New Pulp and Genre Fiction with its latest release- A WEEK IN HELL, the First volume in the Champion City digest novel series by author J. Walt Layne! "Crime stories," Tommy Hancock, Partner in and Editor-in-Chief of Pro Se, comments, "have always been an essential part of Pulp Fiction. It's a genre not restricted by time periods or certain story conventions. Crime is Crime and Crime is everywhere. What J. Walt Layne does in A WEEK IN HELL is tell a tale of crime and murder in a very tried and true style, reminiscent of paperbacks of the 1950s. It's two fisted, it comes at you guns blazing, and doesn't ask for permission or forgiveness." Welcome to Champion City. A megatropolis it isn’t. But you couldn’t arrive at that conclusion by looking at the police blotter. Most everyone in the city would tell you that a day in Champion is like… A WEEK IN HELL. "Writing A WEEK IN HELL," says Layne, "was a chance for me as a writer to try and give something back to the pulp novels and magazines of yesteryear that I enjoyed reading as a kid when no one was looking. Something about the honest, yet ornery sound of the language. The not so innocent victims, the uncompromising men. The story bigger than the hero can handle, yet coming out on top against all odds. Forty Miles of bad road for the big payoff or the big sleep." Written in the style of slang ridden, bullet riddled classic crime Pulp and mystery fiction, Layne’s A WEEK IN HELL drops the reader square into all the corruption and corrosion of human spirit that is Champion City. Dames, gats, gumshoes, and brass cupcakes die, shoot, run and glitter from every page. Edited by David White and David Brzeski, this book features a beautiful cover by Terry Pavlet with design, logo, and print formatting by Sean Ali and Ebook formatting by Russ Anderson. A WEEK IN HELL by J. Walt Layne courtesy of Pro Se Productions. A WEEK IN HELL is available in print for $9.00 from Amazon at http://tinyurl.com/n6meb2q and via Pro Se's createspace store at https://www.createspace.com/4407054. This crime thriller is also available as an Ebook for $2.99 for the Kindle at http://tinyurl.com/lsgbvo5 and on the nook from Barnes And Noble at http://tinyurl.com/n5lgkjx and in most digital formats at http://www.smashwords.com/books/view/348511. For interviews or review copies or further information on the book or the author, contact Morgan Minor, Director of Corporate Operations at MorganMinorProSe@yahoo.com. To learn more about Pro Se Productions, go to www.prose-press.com.